The 1967-68 British spy drama “The Prisoner,” the complete series of which was released recently in an incredible new blu-ray set, is perfect for Halloween. Little seems more horrifying than falling asleep in your own bed and waking up in an exact replica of part of your home on a mysterious island that is the ultimate country club prison. On the other hand, I say bring on the nitrous to anyone who wants to replicate my home and belongings, would allow me to keep my cats, provide me maid service, and have me live in a gorgeous community in a temperate climate. I have paid the price of conforming for far less, and many organizations already identify me as a number. The Prisoner, who is known only as Number 6, is captured and transported to “The Village” because he is a British government agent who resigned abruptly without providing a reason. The rulers of The Village, lead primarily by the Number 2 of the Week, want to know the reason for this career move and subject Number 6 to numerous forms of psychological warfare to obtain that information. They have very creative ways of trying to make him talk. Number 6 keeps busy resisting these efforts and trying to escape the island with roughly the success that Gilligan and his friends achieved regarding their island during the same era. The show was well-suited for the late 1960s because the British mod fashions were a perfect match for the bizarre environment of the Village; additionally, the effort to get Number 6 to reveal the reason for his premature resignation usually involved a hallucinogenic drug or another form of mind control. The related campaign to punish him for not conforming or playing nice with others was another popular theme during those rebellious times. The show also supports my theory that British television kicks the arse of the fare from our side of the pond. Several plots were rather silly or merely weird, but the battle of wills that they depicted were compelling. The issue of whether Number Two and his cronies would break Number 6 was very intriguing and was more important than learning why Number 6 resigned. The show was exceptional as well because, like a typical British series, it had an appropriate lifespan. “The Prisoner” could have run beyond its 17 episodes and did wrap up rather abruptly, but the Brits clearly would have ended it before it reached a point that required introducing Cousin Oliver or Heather Locklear. However, seeing the large killer bubble known as Rover suffocate Cousin Oliver would have been very entertaining. I also enjoyed learning the history of the unusual town in North Wales where the series was shot. Port Marion is now on my list of places to visit when I make my way across the pond. This is assuming that I do not fall in a time rift when I visit Cardiff. Another special feature is a preview of an American mini-series version of “The Prisoner” that will begin airing on November 13. I am hopeful that it is more like the American version of “The Office” than the American version of “Men Behaving Badly.” The involvement of Sir Ian McKellan is a good sign. 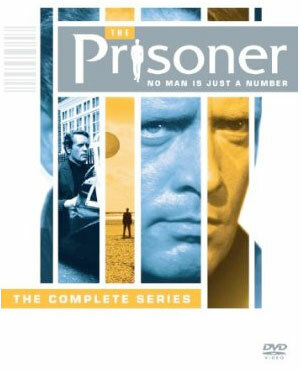 I would love to hear from other fans of “The Prisoner” via e-mail to tvdvdguy@gmail.com. I will likely be attending a meeting of the democratically elected council if I do not respond timely. Since its CBS debut in the summer of 1968, the masterful British TV series THE PRISONER has captivated American audiences. Now A&E presents a definitive collector's edition of the cult classic which is considered one of the most innovative TV series ever filmed. After resigning from a top-secret position, a man (McGoohan) is abducted and spirited from his London home to a mysterious place known only as 'The Village.' Village Residents, known only by numbers, are held captive because each possesses valuable knowledge. The Prisoner, now known as Number Six, battles to protect his mind -- and his humanity -- while struggling to discover the identity of Number One and escape captivity. - Rare alternate version of the episode "The Chimes of Big Ben"